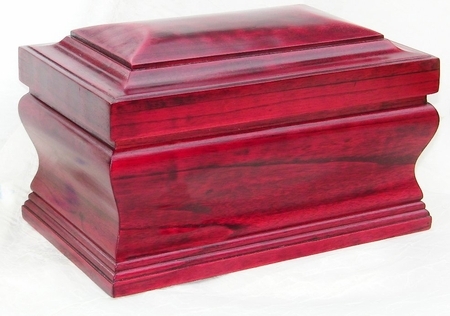 This beautifully carved and cherry finished wooden urn has a cloth American flag draped over the top. The flag is loosely fitted as pictured for a nice appearance and is removable (pictured at left without flag). This urn has a large capacity of approximately 410 cubic inches so that it can serve as a double urn or a large single urn. The understated elegance and traditional styling make it fit discreetly with the decor of most homes.